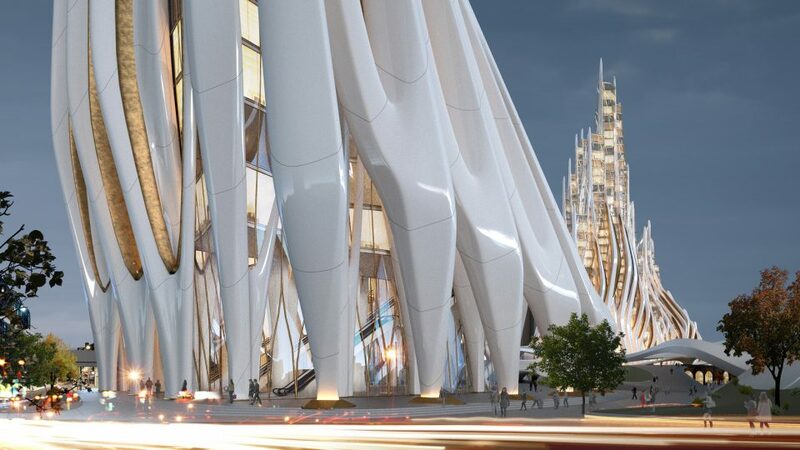 The legacy of famed architect Zaha Hadid continues to unfold months after her death at age 65 as a long list of her final projects continue in various stages of development, from those currently under construction to concepts that may forever remain unbuilt. 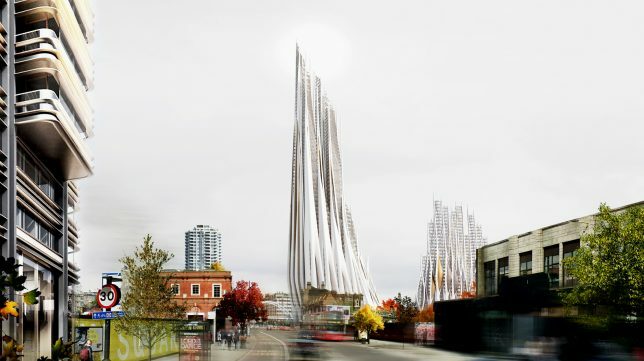 But even putting aside the many outstanding and unrealized designs remaining on her firm’s docket, Hadid’s influence on modern architecture lives on through the work of her students at the Yale School of Architecture. 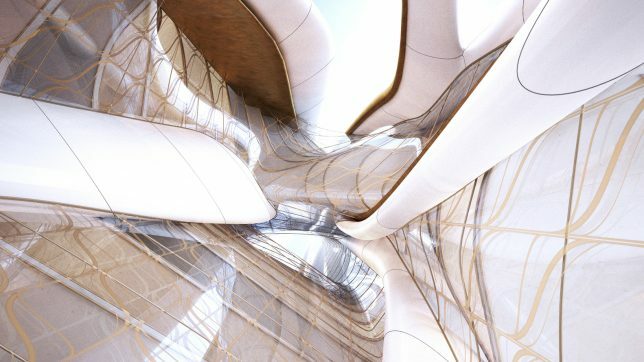 During their semester-long project at Zaha Hadid’s final studio course, a group of students envisioned a striking new development for London’s Bishopsgate Goodsyard, a flowing white complex in the architect’s signature biomimetic style. 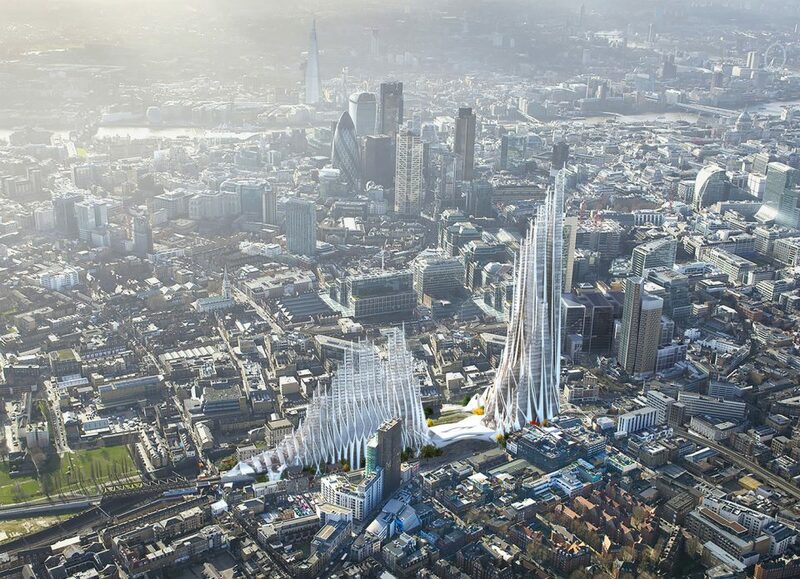 Consisting of a high-density residential tower, a mid-rise block and a train station acting as a bridge between the two, the proposal adds some height and visual interest to the largest undeveloped piece of land remaining in central London. Lisa Albaugh, Benjamin Bourgoin, Jamie Edindjiklian, Roberto Jenkins and Justin Oh present a futuristic network of gleaming white structures with a skeletal appearance, as if someone took the carcass of some extinct megabeast and reassembled it into a deconstructed approximation of a Gothic cathedral. The spaces between the rib-like columns are filled in with wavy walls of glass decorated with veinous ribbons of gold. Viaducts at the base act as access points to a series of public spaces, including a park landscape, connecting the various functions within the complex. 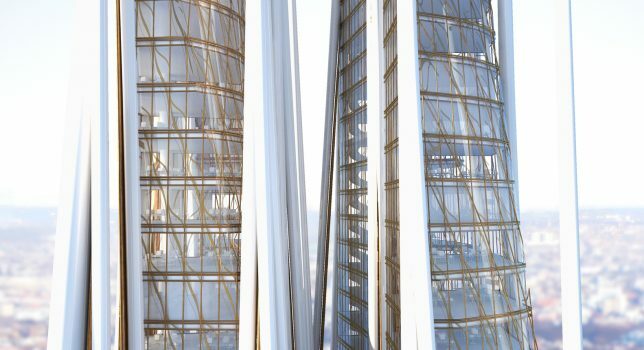 All of the different elements that would normally be contained within a traditional tower core are instead spread into individual ‘strands,’ like the elevators, stairs and mechanical systems, freeing up the tower’s center for unusual cross-views out of all that glass. 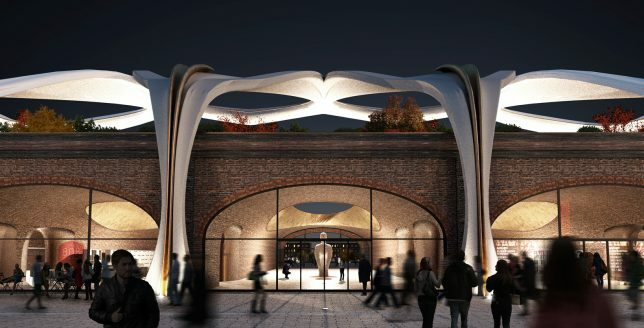 It would seem that the proposal is pure fantasy, given that the developers of the site, Hammerson and Ballymore, have already produced their own proposal. But Londoners have made it clear that they aren’t too keen on that design, with over 11,000 residents signing a petition against it. Critics argue that the developers’ proposal “would result in unacceptable and avoidable significant negative impacts” to the neighborhood.